Welcome to Woollards of Mildenhall, specialists in customised and expertly crafted design solutions for throughout the home. Drawing on years of expertise, we can supply, design and install bespoke designer kitchens, as well as cabinetry and furniture for kitchens, bedrooms and bathrooms. 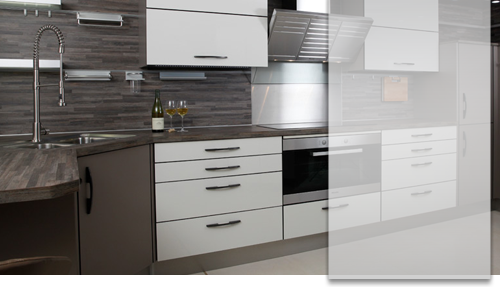 Helping to ensure our customers find the quality assurance they're looking for, we also stock German kitchens and internationally recognisable brands. As a family run business, founded in 1947, taking care of our customers with an experience that's second to none is our goal; complete satisfaction and an impeccable service is something we pride ourselves on. Using a far more thoughtful design approach compared with other kitchen designers, we use our countless years of experience to develop expert design and product selection, transforming your living spaces utilising nothing less than the most innovative design solutions - always delivered on time and within budget. Thanks to our showroom's superb location, we're the number one choice for high quality kitchens in Ipswich. Our simple philosophy is we have no "salesmen". From the moment you visit our showroom, it's you that gets to decide who you speak to, choosing from one or more of our highly experienced expert designers. The most important thing about our customer experience is that we're always keen to ensure that there's no pressure at all. We won't badger you for contact information - we leave that up to you, if would like to be invited for a design consultation. We love for our customers to visit us in person, so we can prove what it is that sets us apart from the rest - seeing is believing! Well within walking distance to Mildenhall town centre, our extensive showroom facilities are located on a three-acre site, easily accessible from surrounding areas include Ipswich and Bury St. Edmunds. In addition to providing a range of bespoke designer kitchens, we can also cater to other areas of your home, with an extensive selection of bathroom, bedroom and home office design solutions. After the initial consultation with one of our designers, we'll usually visit your home to ensure we have a thorough understanding of your existing setup, as well as your needs, goals, hopes and dreams. Once we've visited your home, one of our designers will create an absolutely stunning concept image of your new living space, be it a kitchen or bathroom, helping you to visualise how the final product is going to look. While this technology is useful, it plays just a small part - it is our expertise, in-depth knowledge and meticulous attention to detail which results in the superb kitchens, bathrooms and home offices which we create. As well as being able to offer our expert home design services within the Ipswich area, we can also cover the needs of customers in Bury St. Edmunds. If you are looking for kitchens in Bury St. Edmunds, you'll find our showroom easily accessible and completely unrivalled for quality and customer service anywhere else in Suffolk.